Anne Bell, public relations manager for PBS NewsHour for more than a decade, is leaving her “dream job” at the newsmag. Bell will manage public relations for US Pharmacopeia (USP) in Rockville, Md., a nonprofit that works with the Food and Drug Administration to set quality and safety standards for medicines and food. Her last day with NewsHour was April 15. Years ago, newly graduated from Duke University, Bell managed to get an informational interview at NewsHour with a fellow Duke alum, Judy Woodruff. “I left there with a job as her weekend babysitter,” Bell said. NewsHour appointed Ben Bradley, director of business development since August 2012, to serve as interim PR manager. NPR’s longtime senior trainer, Sora Newman, left public radio this month and is starting her own business, Clear and Present Communication. At NPR, Newman spent years training new pubradio voices, teaching radio style to print reporters, sharpening skills of current employees and running workshops on radio writing, on-air delivery and pitching stories. She developed a two-week boot camp for Kroc fellows; ran a mentoring program in the news department; coached on-air delivery for many station-based, freelance and on-staff reporters; and developed and conducted editing seminars with NPR staff at Public Radio News Directors (PRNDI) conferences and other workshops. Pieces that she edited during her time at NPR garnered duPont-Columbia and Peabody awards. Newman joined NPR in 1982 as an assistant producer. Her last day at the network was April 11; her new business email contact is sorasnewman@gmail.com. WNET has elevated Lesley Norman, director of planning and strategy for American Masters, to production executive in the New York station’s programming department. Norman will report to Stephen Segaller, programming v.p., and help develop strategies to extend WNET’s programming reach. Before arriving at American Masters in May 2013, Norman worked as a senior producer on the 2014 Peabody Award–winning special 180 Days: A Year Inside an American High School for PBS. She also served as executive director of the Filmmakers Collaborative, a nonprofit support organization for independent mediamakers. Garrison Keillor, host of A Prairie Home Companion, has a new book out May 1, The Keillor Reader (Viking Adult). The collection is Keillor’s first to span the full range of his work, including APHC monologues, New Yorker stories, newspaper columns and excerpts from novels. It also includes several previously unpublished essays. Producer Tom Gregory has joined WYES-TV in New Orleans. Previously, he was an executive producer and host at another pubcaster in the city, WLAE-TV, and a host for local Cox Sports Television. In his new role, he will producing more than 200 “Tricentennial Minutes” to air over the next several years, highlighting the city’s history. Eddie Robinson, former on-air news host and producer for WNYC in New York, is the new local Morning Edition host at Houston Public Media. He fills the position vacated by Rod Rice, who retired in January after 12 years. At WNYC, Robinson hosted numerous cultural programs for New York’s Public Radio’s performance venue, the Greene Space. He also co-hosted Radio America’s weekly news program For Your Ears Only and contributed to Studio 360. Previously, he worked as a writer and producer for CBS News and The Early Show. Frank Tavares, who lent his voice to NPR’s funding credits for three decades until last fall, is on the airwaves again — this time at WNPR in Hartford, Ct. “I heard from many people who missed his voice,” said WNPR News Director John Dankosky, “and with our lengthy list of IDs at the top, I thought it would be a perfect place to have him back.” Tavares prerecorded the messages, so he appears at the station only occasionally “to visit,” Dankosky said. “He’s doing this as a favor to one of the radio stations he listens to and supports.” Tavares lives in Hamden, Ct.
Bobby Allyn has started work as an enterprise reporter at WPLN-FM in Nashville. Allyn previously was a courts reporter for The Tennessean and also wrote as a Southern stringer for the New York Times. The Association of Independents in Radio has hired two staffers. Betsy O’Donovan is AIR’s new social media strategist. O’Donovan, a 2013 fellow at Harvard’s Nieman Foundation for Journalism, arrives at AIR from Dublin, where she was freelancing and working toward a master’s degree in creative writing. Bec Feldhaus Adams joins as talent manager; she previously worked as a musician, indie radio producer, and reporter for WKMS in Murray, Ky. She’s also co-founder of Baskhaus, a Kentucky-based independent radio group that distributes news and music programming via PRX. Sesame Workshop has hired Stephen B. Sobhani to fill the new position of vice president, international. Sobhani will oversee the organization’s work in sub-Saharan Africa, developing new partnerships and identifying resources for health and education initiatives. Sobhani spent the past three years as director of private sector engagement and global strategy for women’s and children’s health at the United Nations Foundation and previously directed virology advocacy and global programs for Abbott Laboratories. Nevada Public Radio President Florence Rogers has added chief executive officer to her title, after a promotion by the NVPR Board of Directors. She joined the station in 2001 as program director and rose to g.m. in 2007, overseeing operations at two stations, News 88.9 KNPR and Classical 89.7 KCNV. She’s also a director on the NPR Board. 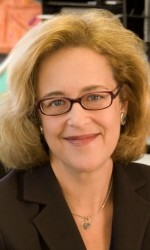 WSHU Public Radio Group in Fairfield, Ct., has hired Sylvia Spitalnick as director of major gifts. Prior to joining WSHU, Spitalnick served as the regional director of the American Heart Association. In her new role, Spitalnick will build relationships with WSHU’s Leadership Circle members in support of the station’s local news initiative and classical music programming. The board of directors of KCETLink in Los Angeles has appointed Jeffrey Levine and Dan German as new members. Levine is vice president and head of television for Random House Studio. German is general partner and founder of Fort Mason Asset Management, a financial firm based in San Francisco. Julie Rovner, NPR’s health policy correspondent since 1998, has accepted a fellowship at the Kaiser Family Foundation. Rovner begins work in May as the Robin Toner Distinguished Fellow, named for the longtime New York Times health and politics reporter who succumbed to cancer in 2008 at the age of 54. During her fellowship, Rovner will work as a senior correspondent with Kaiser Health News, covering health policy and politics and doing multiplatform enterprise reporting. In addition to her career at NPR, Rovner also is the author of Health Care Policy and Politics A-Z (CQ Press). American Geophysical Union hires Rehm, Johnson to head Iowa Pubradio, Vermont creates digital news team and more . . .
AGU is a nonprofit association representing more than 62,000 Earth and space scientists. In her new job, former NPR spokesperson Dana Davis Rehm will work with the union’s staff, members and partners to create and execute integrated content strategies for the organization.